Note: If you attended Trends In Agriculture and have not yet filled out the survey from the meeting, please visit http://www.nama.org/trends/survey.htm. Your responses will help shape the next Trends In Agriculture meeting! This was the question posed by Franck Schuurmans, PhD, Senior Consultant for Decision Strategies International, Inc. And it was the ideal forward-thinking platform from which to launch the inaugural 2008 NAMA Trends in Agriculture Conference. 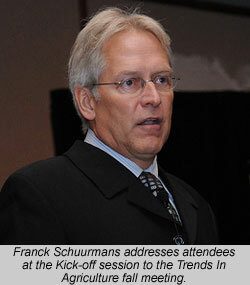 This year, NAMA changed the name of the Agribusiness Forum to Trends in Agriculture. The move was made to directly reflect the meeting’s mission of exploring emerging trends and challenges faced by agri-marketers across the industry. 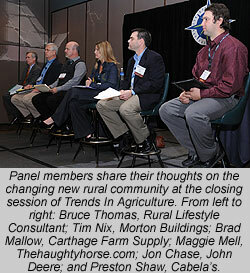 This year’s topic was the burgeoning rural lifestyle market and the decision makers who define it. A record-setting 175 professionals attended the two-day event, up more than 35% from last year. Dr. Schuurmans opened the conference with an eye-opening look at how limiting our own experience-based perspective can be as we consider future strategic options. He used a number of case studies and exercises to demonstrate how the cost of excessive focus can be loss of peripheral vision. Dan Duffy, CEO of United Country Real Estate—a national real estate franchise system specializing in properties in and around small cities and towns—quickly gave attendees the chance to apply those principles. There has been considerable publicity on the current challenges of real estate. Sales of rural acreage, while stronger than many sectors, are also slowing. In response, United Country has honed its strategies of promoting and supporting lifestyle amenities and helping owners increase the value of their land by improving recreation assets. The company’s approach is based on a combination of careful analysis and proprietary research and attendees benefited from a broad range of supporting data they could apply to their own market situation. Wednesday began with a revealing session on the demographics, attitudes, buying habits and other key indicators about the rural lifestyle market from Susan Spaulding, Market Directions, and Courtney Yuskis, Country Living Association. Spaulding emphasized that extensive research revealed that rural lifestylers are connected with their communities and engaged with multiple social networks. She also noted rural lifestylers are more technologically savvy than most people realize and receive an enormous amount of marketing messages. Craig Elbert, a Marketing Strategist with Hallmark Cards explored the concept of winning customers by understanding your brand essence in terms of the “jobs” your product or service performs for them. Yet, as Elbert explained, the company’s success has never been based solely on understanding the historical context, but by projecting brand essence through changing market conditions. He shared how the company uses its “Value StarTM” to apply this process to individual products. The closing panel, moderated by Bruce Thomas, Rural Lifestyle Communications Consultant, explored the “commonalities” and “conflicts” of the two primary segments in today’s agricultural marketplace: the rural lifestyle and farmer markets. Primary differences noted included gender roles and perspectives on the quality/cost (value) continuum. However, panelists also emphasized that both segments share a strong sense of independence/self-reliance, appreciation of outdoor activities and belief in the importance of family. As part of the conference, NAMA also recognized its Professional Development Awards of Excellence Winners. Honors went to Paul Redhage, Communications Manager, FMC Agricultural Products; Beth Andersen, Senior Vice President, Managing Partner, Charleston Orwig, Inc.; and Vernon Benes, Director of Business Development, Beck Ag, Inc.
Special thanks to all of our Trends In Agriculture/Regional Best of NAMA Judging/Rural Lifestyle Resource Center Sponsors as well as our ABEF Sports Night sponsors! 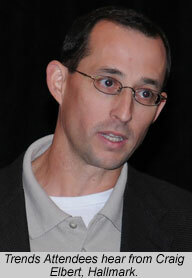 Check out the highlights from Trends In Agriculture at http://www.namablog.org/index.php?paged=2. Join us in welcoming new leaders for the 2009 calendar year! (new) Becky Rasmussen, Drake & Company/Natl. Christmas Tree Assn. (new) R. Frank Timberlake, R.F. Timberlake & Company, Inc.
(new) Andy Vance, AdVance Broadcast & Communications, Ltd. Qualifications of an Executive Committee member are: (1) Be an active, dues-paying member of NAMA; (2) Have served as president of an affiliated chapter or as chair of a council or national committee or as a regional director; (3) The President-Elect and Secretary-Treasurer must have served on the Executive Committee as a Vice President. The Executive Committee is elected by the Board of Directors by a majority affirmative vote at the annual Board of Directors meeting with nominations by the following procedures: (1) A five-member Nominating Committee prepares a slate consisting of one or more nominees for each retiring office of the Executive Committee and presents that slate to the Board of Directors. The Nominating Committee consists of: The immediate past president, who will serve as chair; The next, most recent, past president who agrees to serve; One current chapter president (appointed by the chair); and two other current members of the Board of Directors who are not chapter presidents (appointed by the chair). Nominations may be made from the floor during the annual Board of Directors meeting by any director. Nominees must give oral or written consent to serve prior to nomination. Every effort is made to assure a balanced representation of the various components and geographical diversity of the agri-marketing industry on the Executive Committee. Officers elected to the Executive Committee at the annual meeting will take office on January 1, 2009. Congratulations and welcome new leaders! Several contests were held in conjunction with the 2008 Trends In Agriculture meeting November 11-12 and we’d like to take a moment to congratulate the winners! Two quizzes were sent to all NAMA members to test your knowledge of the Rural Lifestyle market. The quizzes were based on Country Living Association survey results. Everyone who responded was entered into a drawing for a Cabela’s $50 Gift Card. Those who answered the question correctly were entered into a drawing for a free registration to the Agri-Marketing Conference in April in Atlanta. The winner of the $50 Cabela’s Gift Card was Joe Zink, Midwest Messengers and the winner of the 2009 Agri-Marketing Conference registration was Katherine Brozek, Padilla Speer Beardsley. Everyone who registered for Trends In Agriculture by the early cut off date (October 27) was entered into a drawing for a complimentary registration to the 2009 Agri-Marketing Conference in Atlanta, April 15-17, 2009. Congratulations to Marc Ford, Bernstein-Rein who won the conference registration! This promotion called upon NAMA members to recruit a business associate, peer, or friend as a new NAMA member before November 5 and both were entered into a drawing for a new GPS. Congratulations to Mike Campbell, Walz Tetrick Advertising, for taking home a new GPS! The Agri-Business Educational Foundation (ABEF) hosted a sports night reception at the Trends In Agriculture meeting on Tuesday, November 11. Special thanks to our ABEF Board members listed below for their help in selling raffle tickets to raise money for the ABEF. The prizes given for the ABEF Raffle were a $200 gift card to Bass Pro Shops and two $50 gift cards to Whiskey Creek Wood Fire Grills. Congratulations to Greg Guse, Paulsen Marketing, for taking home the $200 Bass Pro Shop Gift card and to Steve Betts, United Suppliers, Inc. and John Vasichek, Red River Farm Network, for taking home the Whiskey Creek gift cards! Stephanie Gable, NOVUS Intl., Inc.
Lou Ireland, Pioneer Hi-Bred Intl., Inc.
Mark your calendars for the regional/chapter Best of NAMA Ceremonies. These ceremonies are celebrations of those entries that won first or merit in the regional competition. Entries that win first or merit at the regional competition and score above the minimum point standard are eligible to advance to the national competition in February. Winners of the national competition will be announced at the national Best of NAMA Ceremony which kicks off the 2009 Agri-Marketing Conference, Hot Ideas, Sizzling Solutions, April 15, in Atlanta, Georgia. 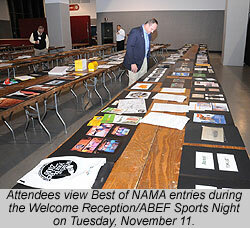 For more information on the regional Best of NAMA ceremonies, keep checking the Best of NAMA Calendar at http://www.nama.org/amc/bon/calendar.htm. The registration for the 2009 Agri-Marketing Conference, Hot Ideas, Sizzling Solutions, is open. The conference will take place April 15-17 in Atlanta, Georgia. Register now to get the payment in your 2008 budget year! Registration rates remain the same as in 2008! Early registration rates will end on March 25, 2009. After that, late rates apply. For the latest Agri-Marketing Conference information visit http://www.nama.org/amc. For registration information visit http://www.nama.org/amc/registration.html. To register online now for the conference, visit http://www.nama.org/amc/register.html. In addition, hotel reservations can now be made online. We are pleased to have this year’s conference at the beautiful Atlanta Marriott Marquis, which has just completed a $185 million renovation. Hotel rates are $115 single/double (that’s not a type-o folks, it’s really $115!). The hotel cut-off date is March 17, 2009. Reservations made after March 17 will be subject to higher rates and potential unavailability. Once again, we will be offering two room blocks, one for the professionals and one for the students. To make your hotel reservations under the professional block, visit http://www.marriott.com/professionals. To make hotel reservations under the student block, visit http://www.marriott.com/students. Every year at the Agri-Marketing Conference, professionals involved with selling products and services into the agricultural marketplace gather to explore the latest in techniques, trends and practices. If your target audience includes agrimarketers, you can’t afford to miss the 2009 Connection Point. In today’s world of voice mails and e-mails, the Connection Point offers a unique opportunity for face-to-face contact. For more information on the Connection Point visit http://nama.org/amc/ts/connection.htm. To sign up for booth space now visit http://nama.org/amc/ts/signup.htm. Note: Exhibitors who sign up for a booth by February 4 will receive a complimentary registration for NAMA’s February 5th webinar on Maximizing Your Trade Show R.O.I. with Scott Hanna, Skyline Displays. The deadline for submitting nominations for the Agribusiness Leader and NAMA Marketer of the Year awards is January 15, 2009. Both awards will be presented at the 2009 Agri-Marketing Conference, April 15-17 in Atlanta, Georgia. The Agribusiness Leader of the Year is NAMA’s highest honor. The award honors an outstanding leader in agribusiness, education, government service or other agribusiness related areas. Nominees do not need to be NAMA members. Fill out the nomination form on-line now at http://www.nama.org/awards/agribusinessform.htm. Or download the Agribusiness Leader Nomination form in an Adobe .PDF format by visiting, http://www.nama.org/awards/agbusapplication.pdf. Note: The Agri-Marketer of the Year Award was changed to the Agribusiness Leader of the Year Award in 2001. Below is an honor roll of the past Agri-Marketer/Agribusiness Leader of the Year awards. 1996 H.D. “Harry” Cleberg, Farmland Industries, Inc.
1993 Robert Wichmann, Pioneer Hi-Bred Intl., Inc.
1992 Gary Parker, Lindsay Manufacturing Co.
1989 Nicholas Babson, Babson Brothers Co.
1987 David Garst, Garst Seed Co.
1985 Dr. Kenneth Bader, American Soybean Assn. 1983 Owen Newlin, Pioneer Hi-Bred Intl., Inc.
1981 Robert Lanphier, AGMED, Inc.
1980 Joe Ecker, Gehl Co.
1979 Robert Book, Elanco Animal Products/Eli Lily Co.
1977 Donald Fritz, Farmers Hybrid Co.
1971 Del Walker, Funk Brother Seed Co.
1969 Lyle Yost, Hesston Corp.
1965 George Varnes, Eli Lily Co.
NAMA recognizes its active members with senior management of marketing and/or sales responsibilities with the NAMA Marketer of the Year award. This award is the most prestigious honor awarded to an active member of the association and honors outstanding accomplishments in the field of agri-marketing directly to ag producers. Nominees MUST be NAMA members. Fill out the nomination form on-line now at http://www.nama.org/awards/namamarketerform.htm or download the NAMA Marketer of the Year nomination form in an Adobe .PDF format by visiting, http://www.nama.org/awards/mktrapplication.pdf. Please note: This award was created in 2001. Below are the past NAMA Marketer of the Year award recipients. 2008 Dave Rhylander, Delta & Pine Land – Division of Monsanto Co.
NAMA’s Trends in Agriculture: Rural Lifestyle Marketing wrapped up with a panel discussion of marketers and retailers talking about the effect of the changing rural economy on the marketplace. The $32 billion rural lifestyle market is seen as a true growth opportunity. Tim Nix, Marketing Manager for Morton Buildings talked about how to meet the needs and expectations of the market. NAMA honored three members for professional development during its Wednesday luncheon. Honored in marketing communications was Paul Redhage, FMC Communications Manager; in Public Relations, Beth Anderson, Charleston Orwig; and in sales, Vernon Benes of Beck Ag. Below are video highlights of acceptance comments of those present. 2008 NAMA President Patty Travis passes the leadership gavel to incoming president Carol Anderson. The new president shared her thoughts about the challenges that lie ahead for NAMA and its membership. How do businesses make rural lifestylers loyal customers? Craig Elbert, the Marketing Strategy Manger for Hallmark Cards had some ideas for the NAMA Trends in Agriculture: Rural Lifestyle Marketing conference. He talked about when markets change from traditional ag customers to rural lifestyle customers new strategies are needed to build long-term loyalty.